Durga Puja, the grand festival of Bengalis, is just around the corner. You will hardly find a Bengali who doesn’t wait eagerly for the grand festival. Starting from morning puja, bhog, pandal hopping to mouth-watering delicacies, Durga Puja has a lot to offer. While the rest of the nation fasts during these 9 days, if you go to a Bengali household, you will be served with authentic dishes made to perfection. Whether you have a sweet tooth, or love indulging in some fried snacks, Bengali cuisine has it all. In this blog, we list 5 must-have dishes you can make at home this Durga Puja, even if you are not a Bengali. Thanks to the smart chef appliances from KENT, preparing these dishes is no more a hassle. Breakfast during Durga Puja is incomplete without a plateful of soft and fluffy luchis. Made of maida, luchis have a light golden color, unlike pooris which are golden brown. The secret to making perfect luchis is the dough. To make luchis, you need the right amount of wheat flour, ghee and a pinch of salt. Make sure you take enough time to knead the dough to make the perfect luchis. To make your work easy, you can use KENT Atta Maker and Bread Maker to knead the dough. All you need to do is add the ingredients, select the right option and the dough will be ready in minutes. Another typical Bengali recipe, cholar dal is made with Bengal gram (channa dal). However, the procedure for making this dish is quite different. The combination of delicious fragrance, crunchy texture and mildly spicy taste is something that sets the dish apart. Slow cooking the cholar dal brings out the best flavours of the dish. 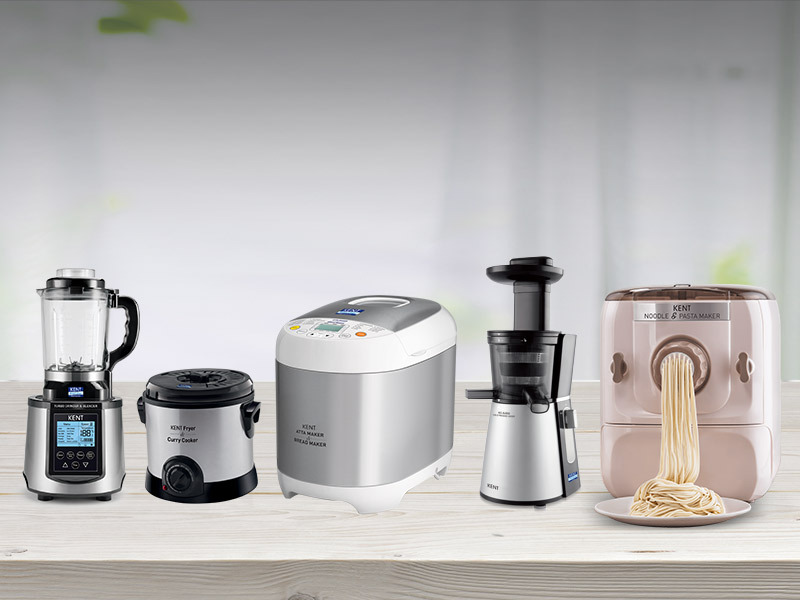 You can use the Fryer and Curry Cooker from KENT which is ideal for preparing slow-cooked dishes. To get a crunchy texture, you can add small pieces of coconut. Khichdi is a common dish that most of us eat to soothe an upset stomach. However, Bengali khichudi is an exotic dish that you need to try at least once. Moong dal (yellow lentil) and rice are the main ingredients used in making this khichuri. What makes the dish different is the dry roasted dal that adds to the aroma and flavour of the recipe. The perfect balance of salt, spices, sugar makes it an easy to make yet tasty lunch option. 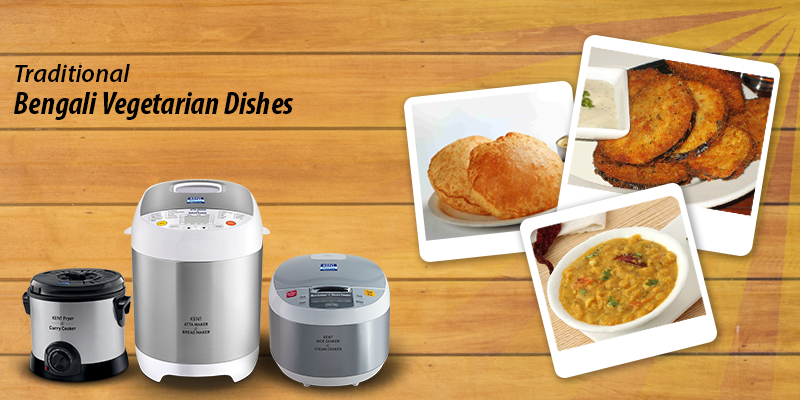 You can use the KENT Electric Rice Cooker and Steam Cooker to prepare the recipe with ease. If brinjal makes you cringe, you need to try this fried delicacy from Bengal. The brinjals are marinated with a pinch of salt, turmeric and chilli powder and coated with besan batter before deep frying them. To deep fry the brinjals, you can take use the KENT Fryer and Curry Cooker, which makes it easy to prepare fried foods safely. Serve this with a plateful of khichuri, or plain rice and dal. So, the next time you think Bengali cuisine is dominated by non-vegetarian dishes, you need to check out these dishes. These are only a few of the vegetarian dishes that you can make at home this Durga Puja. There are a lot of other Bengali vegetarian dishes that you can try out, not just during Durga Puja but also any time of the year when you want to eat something different. With the help of the smart kitchen appliances, you can make these dishes in a jiffy.